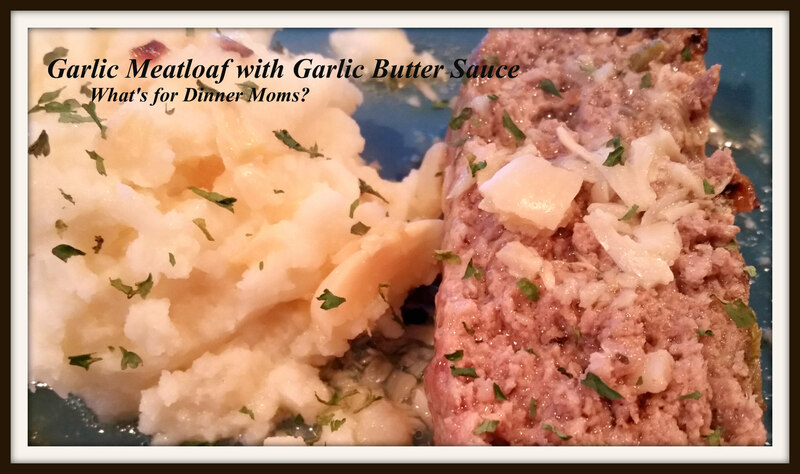 Garlic Meatloaf with Garlic Butter Sauce – What's for Dinner Moms? My family loves garlic. This is the perfect meatloaf and mashed potatoes for us. Minced garlic in the meatloaf, roasted garlic in the sauce over the top of the meatloaf and mashed potatoes? Perfect! Don’t have time to make the meatloaf just before dinner? Form the meatloaf the evening before or morning that you want to make it. Wrap it and keep it in the refrigerator until you are ready to cook. The flavors will meld together even better if allowed to sit for a bit. The meatloaf was super tender and juicy. The garlic flavor was mixed through out the meatloaf but was not overpowering. The roasted garlic in the sauce mashed into the potatoes and on top of the meatloaf was mellow but added a delicious flavor. Serve this with a green vegetable or salad for a complete meal. Preheat oven to 375 degrees. Line a rimmed baking sheet with parchment paper and place metal wire baking rack on top. In a skillet over medium-low heat melt butter. Add onions and celery to pan and saute until onions and celery are soft. Add garlic at end and saute for 2-3 minutes until well fragrant. Remove pan from heat and allow to cool. In a large bowl mix all ingredients together until well blended. Form into a loaf and place in oven to bake for 40 minutes or until cooked through. In a saucepan combine chicken stock, butter and garlic. Bring to a boil and reduce heat to simmer. Simmer for 30 minutes until mixture starts to thicken a bit. Crush garlic with a fork. Add salt and pepper to taste. Lovely meatloaf recipe. I am not a big fan of garlic but I think you could definitely flavour with a different sauce like mushroom. Thank you. I am not a fan of mushrooms but my kids love them. Oh yum, YES please! I love garlic. Looks great. We love garlic in our house too! I’m pretty sure following your page is the worst mistake I’ve made this year. I feel that I’m going to be gaining a lot of weight from these amazing recipes!! Hehe! Thank you so much! Garlic draws my family in every time. There never seems to be enough of it. I know. The only thing better than garlic is garlic AND butter.